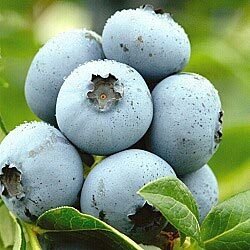 Vaccinium Corymbosum or Blueberry Bush is a giant fruited shrub loaded with vitamins. The large penny sized fruit of this shrub will surprise you; not only by the sheer volume of fruit, but also by their wonderful flavour. This is a hardy deciduous shrub and these varieties are great for small spaces. Grow them in large containers or in the border. Use plenty of Azalea or Rhododendron soil in the planting hole or pot as they prefer a light acid soil. Gorgeous red foliage in Autumn.